Mountain biking can take you to the places the others don’t see, Mountain biking can help you gain fitness and stay healthy, Mountain biking can be a shared experience with family or new friends. 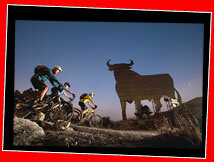 Mountain Bike Granada have developed routes to cater for anyone who wants to try the sport. Trained guides, quality bike hire, protective equipment and trail knowledge second to none means we provide the ultimate Granada Mountain Bike experience.